California's Inland Empire has become a hotspot for retirees, and no town in the region has better 55+ options than Beaumont. Beaumont, CA is quickly becoming a top choice for retirees who want to live the California lifestyle. 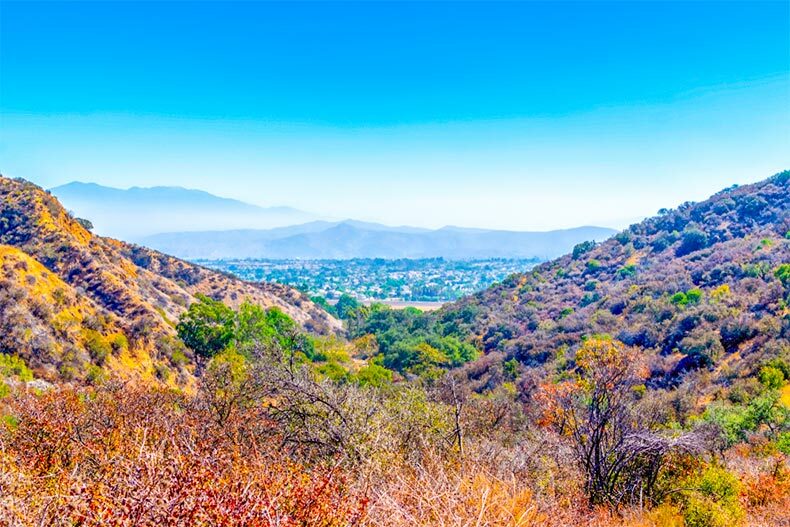 The city’s ideal location in the Inland Empire makes it easy to enjoy all that Southern California has to offer. From big-city attractions to outdoor adventure in the mountains, Southern California’s best destinations are easily within reach. Beaumont residents can be on the sand of Orange County’s beaches or strolling through Downtown Los Angeles in just under a two-hour drive. Beaumont also has a lower cost of living compared to most of Southern California, allowing 55+ homebuyers and retirees to make the most of their budget. Learn more about Beaumont’s fantastic 55+ communities, where residents can expect resort-like amenities and modern homes. Nestled in the scenic San Gorgonio Pass, Four Seasons at Beaumont provides a quiet atmosphere, views of the surrounding mountains, and top-notch amenities in an exclusive environment. Development began in 2005 and new homes are still being constructed. Upon final build out, this gated 55+ community will be home to 1,923 residences, including single-family homes and attached homes. Buyers can choose from a selection of over 30 floor plans. These finely crafted homes range in size from 1,183 to 2,775 square feet. Buyers can expect modern features, such as spa-like bathrooms and luxurious gourmet kitchens. Four Seasons at Beaumont offers a great lineup of activities. There are several recreation centers where residents can indulge in resort-like amenities and socialize with neighbors. The Lodge is the community’s central recreation center, offering 25,000 square feet of fun. It is home to a bistro, cozy lobby with a fireplace, arts and crafts studio, ballroom, theater, and more. Outdoors, residents have access to a pool, patio and barbecue area, scenic lakes, trails for walking and biking, and multiple courts for tennis, pickleball, and bocce ball. At the Beaumont Spa, residents can unwind and recharge. This on-site spa has a fitness center, aerobics and dance studio, full-service salon, heated spa, and billiards. There is also an additional clubhouse called the Summit, which features an indoor pool, exercise room, lounge, catering kitchen, and more. Solera at Oak Valley Greens is a charming 55+ community in Beaumont. Residents here appreciate the privacy and safety of living in a gated community. With 1,290 homes, it also offers a more intimate atmosphere compared to larger developments. Development was carried out from 2002 to 2007, so the community’s homes offer modern features, such as ten-foot ceilings and Corian countertops. These finely crafted single-family homes range in size from 1,392 to 2,127 square feet. Rich with amenities, Solera at Oak Valley Greens allows residents to embrace an active lifestyle. The community’s social hub is the Oakmont Clubhouse, an 18,000 square-foot recreation center designed to meet the needs of today’s active adults. Residents can stay fit with a state-of-the-art fitness center, indoor walking track, and a studio for aerobics and dance. There is also a catering kitchen, table tennis, ceramics studio, sewing studio, and more. The amenities continue outdoors with a pool and spa, patio, tennis courts, bocce ball courts, and walking trails that meander through beautiful natural spaces. Golfers will appreciate the community’s on-site 18-hole golf course, which offers an exciting game and views of the nearby mountains. For those seeking a brand-new home in Beaumont, Altis is sure to be a top choice. Development at this 55+ community began in 2017, and after recently holding its grand opening celebration, Altis is officially open for sales. Upon final build out, Altis will consist of 704 single-family homes designed for low-maintenance living. These exquisite homes range in size from 1,473 to over 3,000 square feet. Developer Pardee Homes takes a modern approach to active adult living with its “GenSmart Suite,” which is an optional second floor. On select homes, buyers have the option of adding a second floor, which functions as a completely separate living space. Modern buyers will also appreciate Pardee Homes’ LivingSmart® program, which includes energy-efficient features, sustainable building materials, and more. The planned amenities in Altis will provide an elevated lifestyle for active adults. The VuePoint Residents Club, which is a 16,000 square-foot recreation center, will feature a top-notch fitness center, yoga studio, arts and crafts studio, and a great room with a fireplace where residents can socialize. At the resort-style outdoor pool, plans call for swim-up cabanas and spacious poolside lounges. Additional outdoor amenities include a spa, pickleball courts, barbecue areas, a fire pit, and 22 acres of parks and natural spaces.